Once again, it’s that time of year when dictionaries begin to publish their “word of the year” (WOTY). For almost 30 years, different publications or groups have been publishing a selected English word of the year. The American Dialect Society (ADS) lays claim as first to publish an English WOTY, beginning in 1990. All of the chosen words from 1990 to the present can be found on their website. Many other countries, including Denmark, Japan, Norway, Portugal, Russia, the Ukraine and India, also have a word of the year. The German word of the year (Wort des Jahres), selected by the Gesellschaft für deutsche Sprache (for those who speak German) or Association for the German Language, dates back to 1971, the oldest according to our research. Oxford English Dictionary has also published its WOTY, “toxic,” defined as poisonous. According to Oxford, the Oxford WOTY “is a word or expression that is judged to reflect the ethos, mood, or preoccupations of the passing year and have lasting potential as a term of cultural significance. Toxic experienced a 45% increase in look ups on oxforddictionaries.com in 2018. The word “toxic” is often used in conjunction with other words, such as “toxic waste,” “toxic reaction,” etc. In 2018, the word “toxic” was most used with was “chemical,” perhaps partially due to the nerve agent poisoning of a former Russian intelligence officer and his daughter in Britain this fall. Never underestimate the ability of words to lift you up, sometimes bring you down and to capture the essence of an experience or a period in time. Used judiciously, they can communicate a powerful message. Overused, they become meaningless and ignored. 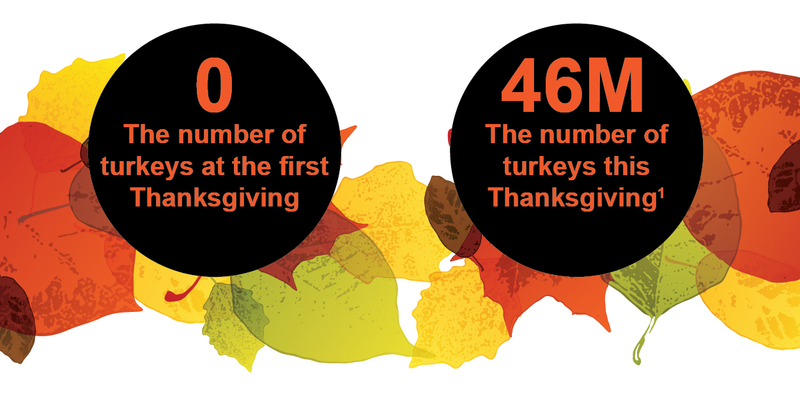 As you know, the “first” Thanksgiving was a celebration between Pilgrims and Native Americans in 1621. The Pilgrims had a lot to celebrate, after all, they were the Mayflower passengers who lived through a 66-day trip, disease, scurvy, starvation and malnutrition. Had it not been for the Native Americans…well you know the rest of the story. It wasn’t until 1863 that Abraham Lincoln made Thanksgiving an annual celebration to be held on the final Thursday of November. In 1941, while FDR was president, Congress officially changed Thanksgiving to the fourth Thursday in November, rather than the last. There is no account of turkey at the original 1621 3-day feast, just fowl and deer. Additionally, there was no pie, of any kind; no potatoes, they were not grown in the new world; and not a lot of women (records have differing numbers, but there were probably about 9 women, 5 of whom were actually teenagers or young girls). Many of our Thanksgiving “standards” were nowhere to be found in Plymouth, it was a take-what-you-can-get, grow, and kill kind of party. Imagine how shocked the Pilgrims would be to find out we can order an entire cooked Thanksgiving meal online. The Farm Bureau Survey tells us this year, on average, we will spend $48.90 to feed ten people with a very basic menu. 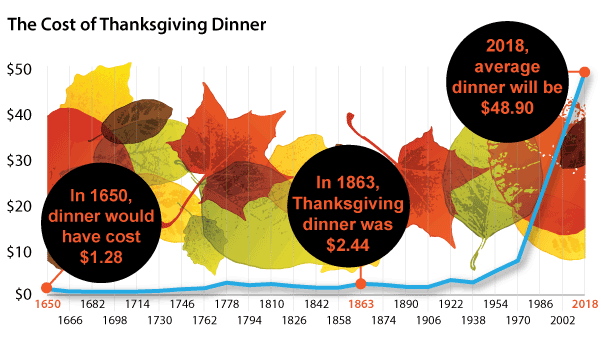 In reality, most Thanksgiving celebrations in America probably cost more than $48.90. For one thing, the Farm Bureau Survey does not include wine, beer or appetizers, nor does it include the airline ticket to get your kid home from college for the holiday. Over the centuries, Thanksgiving has taken on many traditions and year after year, we, as a country, and as individuals are certain to have things to be thankful for. So too has the menu changed and morphed with new and interesting options from multitudes of sources. Whether you are a Thanksgiving traditionalist or a new-fangled chef, Optima Group would like to share some of our favorite recipes and wish you and your family a very happy and healthy Thanksgiving! Beat eggs and sugar very light. Fold in flour sifted with salt and baking powder. Add vanilla extract and melted butter. Sprinkle sugar on top and bake in well-greased small individual tins in hot oven at 425°F twelve minutes. Serve with thin coating of white frosting and some kind of candied fruit on top. I like this cornbread recipe, but I add a little bit of honey for flavor and sometimes some kernels of corn for texture. This is a coffee cake everyone likes to nibble on until the Thanksgiving meal. Preheat oven to 350 degrees. Butter and flour a 9-inch nonstick tube or bundt pan. Beat butter, sugar together under smooth and creamy looking. With mixer on low speed, add flour mixture in three additions alternately with sour-cream mixture in two, beginning and ending with flour. Mix just until moistened. Spread a third of batter in pan; sprinkle with a third of topping. Repeat twice, ending with topping. Bake until a toothpick or knife inserted in center comes out clean or with just a few moist crumbs, 30 to 40 minutes. Cool in pan 30 minutes. Turn out of pan; cool, top side up, on a rack. 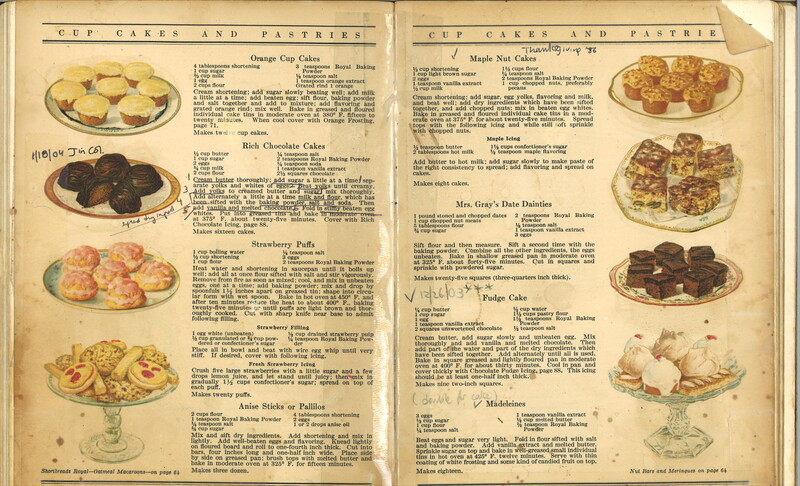 An old Thanksgiving recipe from the Stevens clan that the Stevens didn’t much like, but anyone marrying into the family did. It’s a great counterweight to the pie regimen. Stir from time to time to prevent fruit from rising. Pour into gelatin mold. Keep in refrigerator until gelled. This is a Hubbard family favorite appetizer for every holiday. Named after the neighbor who passed the recipe on about 65 years ago. Stir together everything but the shrimp, once combined add the shrimp and gently blend. Cover and put in refrigerator for an hour or so before serving. Serve in a shallow bowl, use toothpicks or small appetizer forks to eat. Make the crust: In a food processor, pulse together the flour and salt. Add butter and pulse until the mixture forms chickpea-size pieces. Add ice water, 1 tablespoon at a time, and pulse until the dough just comes together. It should be moist, but not wet. On a lightly floured surface, gather the dough into a ball. Flatten into a disk with the heel of your hand. Cover tightly with plastic wrap and refrigerate for at least 1 hour and up to 2 days. On a lightly floured surface, roll out dough to a 12-inch circle. Transfer crust to a 9-inch pie plate. Fold over any excess dough, then crimp edges. Prick crust all over with a fork, then chill crust for 30 minutes. While the dough chills, heat oven to 375 degrees. Line chilled crust with aluminum foil and fill with pie weights or dried beans. Bake for 20 minutes; remove foil and weights and bake until pale golden, 5 to 7 minutes more. Cool on rack until needed. Lower oven temperature to 325 degrees. In a large bowl, whisk together the pumpkin purée, eggs, cream, dark brown sugar, brandy, ginger, cinnamon, 1/2 teaspoon salt, the nutmeg and clove. Pour mixture into the cooled pie shell. Transfer pie to a large baking sheet. Bake until crust is golden and center jiggles just slightly when shaken, 50 to 60 minutes. Cool completely before serving. Olver, Lynne. American Thanksgiving. FoodTimeline.org. Jan. 3, 2015. The paper briefly discusses the drawbacks of payment systems that rely on third parties (financial institutions) to process payments, then lays out the mechanics of developing a cryptocurrency/system that facilitates direct transactions from one party to another. Without delving into the technicalities of the paper, it has served as the foundation for the development of the cryptocurrency market as we know it. Fast forward ten years to today, and you have somewhere between 17 and 18 million (mining of Bitcoins is going on as you read) bitcoins “in circulation” against a predetermined maximum possible of 21 million. 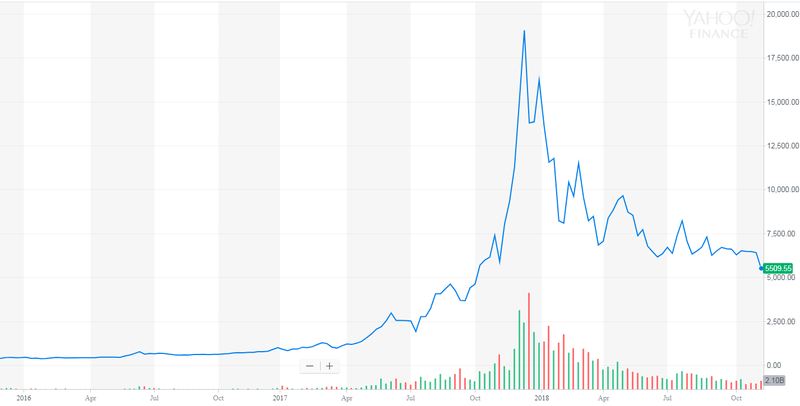 The value of a bitcoin has fluctuated dramatically, reaching a rate of one bitcoin equaling almost $20,000 before plunging dramatically and currently trading close to $5,000. Other cryptocurrencies, such as Litecoin, ZCash, Ethereum and others) have been equally volatile. But the times, are they a’changin? In September, 2017, Jamie Dimon, CEO of JP MorganChase, referred to Bitcoin as “a fraud,” and most financial institutions appeared to agree. But there seems to be evidence of, if not a sea change, at least a slight shift. In May of 2018, Goldman Sachs, which had been publicly anti-cryptocurrency as a legitimate currency, publicly changed its tune. The firm has since been “considering” how to participate in the cryptocurrency market. One can now trade Bitcoin futures on the CFE, CME and even through your retail TD Ameritrade account. So love it or hate it, cryptocurrency appears to be here to stay….perhaps. Last month Fidelity announced the opening of its Wealthscape Integration Xchange. The Xchange is an open market “digital store” designed to make it easy for Fidelity’s clearing and custody clients to assemble the best technology solutions for their practices. 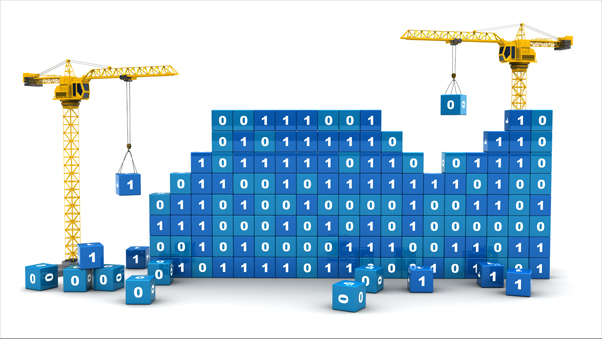 The Xchange leverages Fidelity’s integrations with over 100 third-party technology vendors. These include such well-known providers as Black Diamond, Orion, Envestnet Tamarac, Junxure, Redtail and SS&C as well as a broad selection of supporting technologies. Along with access to these platforms, Fidelity offers an array of capabilities to facilitate integration and data communication across solutions. The Fidelity Xchange is the latest evidence of leading custodians’ acceptance of the value of an open architecture approach to advisor technology. Schwab too has recently come to recognize the limitations of its Portfolio Connect platform and has promised to double its current technology integration by the end of next year. First on the block, TD Ameritrade made the move to open architecture a few years ago with its VEO platform. 1. Advisor technologies are being developed at a rapid rate making it difficult for any single developer to keep pace with the state-of-the-art solutions across all platform functions. 2. As advisors use an expanding array of technologies, vendors are being forced to facilitate integrations to meet market demand. 3. Advisor technologies are expanding beyond portfolio management to CRM, planning, and digital client communications, again putting strain on traditional solutions to provide the fullest range of leading-edge available functionality. 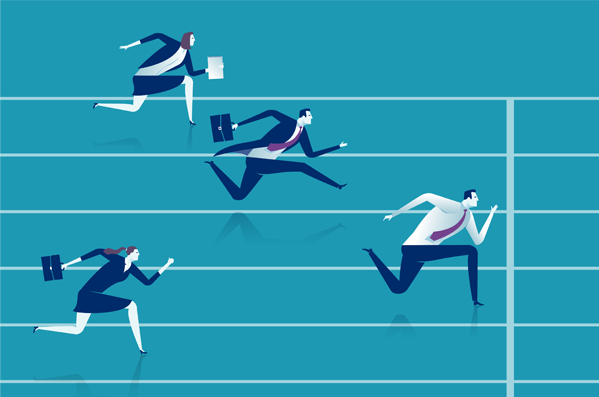 With competition heating up, wealth advisors, more than ever, are challenged to justify their fees. When times are good, clients may attribute it to market momentum, not the advice they’re getting. When markets turn, an advisor’s fee is more visible and may be questioned, particularly if there is a loss. These numbers confirm what most advisors already know: their value exceeds the price their clients pay for it and goes far beyond managing investments. The key is communicating this value to clients. That’s where Optima Group can help. We specialize in defining an organization’s value and promoting it. Let’s talk about what we can do for you. Call us at 203-255-1066. 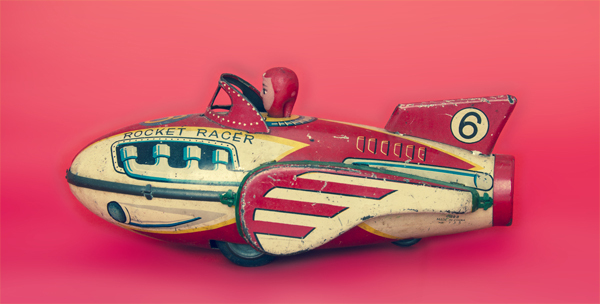 Recently, there has been an interesting uptick in the return of nostalgia brands. This was brought home by the announcement in late August of the return of the iconic FAO Schwarz toy store brand. FAO Schwarz, which closed in 2015 and was owned by the now defunct Toys “R” Us, was acquired by ThreeSixtyGroup Inc., in 2016. The firm has big plans to revive the brand, beginning with a bricks and mortars presence in Rockefeller Center which is being designed to be “as much about the experience as the buying” and is set to include “product demonstrators, magicians and men and women playing various costumed roles, including toy soldiers.” Further, the costumes for the toy soldiers have been designed by one of the millennial celebs of the moment, Gigi Hadid, a super model, designer and general lifestyle influencer. Several other retail brands of the past appear to have captured the hearts of consumers. Adidas has hopped on the athleisure wear bandwagon and has also been endorsed by a number of celebrities of all ages. Ditto, the Birkenstock, a brand formerly worn by the socially, not fashion, conscious. This list goes on, Tommy Hilfiger, Polaroid and almost every comic book character you knew as a child. And who can forget the public mourning, followed by jubilant celebration, over the imminent demise and subsequent rescue of Hostess Twinkies, when Hostess Brand went under? Much of the success of recent brand revitalization has been through an association with a successful spokesperson, celebrity or retail brand; the FAO Schwarz brand is a prime example. Celebrity collaborations are becoming a commonplace to draw attention and potentially a new audience to a brand. Gigi Hadid, for example, really gets around; she has also collaborated with Tommy Hilfiger to revitalize that brand and with Stuart Weitzman, a maker of classic high-end women’s shoes, to bring the brand to a new, younger audience. When EF Hutton talks (again) will everyone listen? Financial services have been less interested in reviving old brands, which may be because most brands have disappeared under less than positive circumstances. But there is an example in the revival of the once venerable EF Hutton brand, which disappeared in the 1990s through various mergers after the firm suffered a number of financial and regulatory issues. Fast forward to the 2000s, and the brand, then owned by Citigroup, was sold during the financial crisis to a group that includes a grandson of EF Hutton. The new EF Hutton was formally relaunched in 2016 and offers online discount trading, a digital advisor platform and research on cryptocurrency, as well as being the sponsor of a prospective new cryptocurrency exchange known as ACEx. 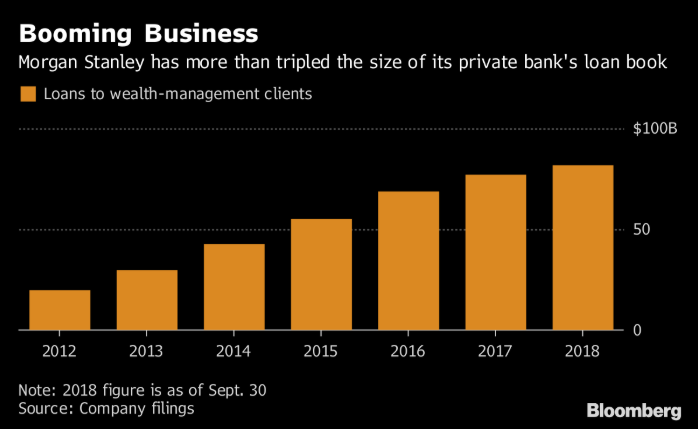 No information is available on how the firm is doing, so it remains to be seen whether the nostalgia for brands of the past extends to the less tangible world of financial services. This leads one to ponder the question of who would be an appropriate celebrity spokesperson, influencer or collaborator for reviving an old financial services brand. We’re guessing Warren Buffett is otherwise occupied, unfortunately…. Recent reports suggest that traditional trading/brokerage firms like Goldman Sachs and Morgan Stanley, having been forced into becoming bank holding companies by the financial crisis, are rapidly increasing their lending businesses to HNW and UHNW clientele. The chart below shows the rapid build in Morgan Stanley’s private bank loan book since 2012. Goldman’s book also more than quadrupled in the same period. Although not without risk, lending to wealthy clients can be a profitable business on its own. But it has added benefits for bank wealth management units. • Access to specialized loans, along with a wider array of banking products, helps distinguish these units from standalone RIAs whose product set is largely confined to planning and investments. • Loans, particularly those collateralized by distinctive assets like art or collectibles, are sticky and tend to more strongly tie borrowers to the institution. • The presence of lending makes it more difficult for wealth managers/brokers to break away from their employers in favor of platforms that do not include banking products. Given these benefits, we expect the pace of HNW lending and other specialized products and services to continue to grow as financial institutions search for ways to remain competitive in the HNW and UHNW space and realize more profit from their expanding wealth relationships. In the wake of volatile markets this week, we thought it useful to revisit the concept of behavioral investing. No matter how much advisors stress the importance of taking prudent risk in the pursuit of long-term gain through rational asset allocation, many people let their emotions rule in the face of short-term turmoil. In a recent piece, Cadaret, Grant in association with InvestmentNews deconstructed behavioral investing into six elements that are worth keeping in mind during uncertain times. 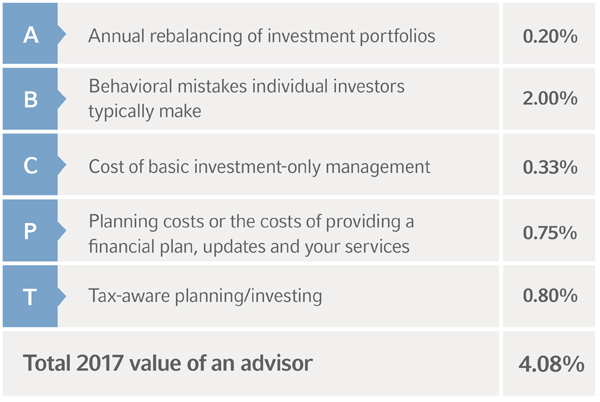 * Understanding them can help advisors better help their clients when they may need it most. 1. Loss Aversion. 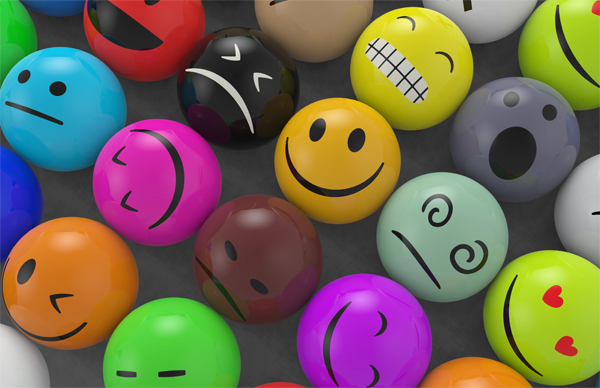 Research shows that to an individual, losing feels more than twice as bad as winning feels good. The average investor would need the prospect of realizing $225 for the same level of risk of losing $100. The implication is that however rational and well-meaning an investor may be when filling out a risk profile, their fear of loss may override. Just as in good times an investor may be irrational in the pursuit of gain, so he or she may impulsively pull back at exactly the wrong time. 2. Anchoring. Anyone trying to sell a house in a buyer’s market may have experienced anchoring. It’s the tendency to focus on one piece of information – in this case the property’s purchase price – in evaluating a reasonable selling price. Often investors “anchor” on a fixed price of a security – what they paid for it or what they somehow think it’s worth now – before parting with it. This emotional attachment can get in the way of rational action, or inaction. 3. Familiarity Bias. Part of our survival instinct is to evaluate new situations through the lens of our experiences. Our minds tend to seek out similarities to past events to come up with a conclusion or assessment of a current situation, no matter how new and unrelated it may be to what we’ve experienced in the past. So, familiarity with domestic equities or mature industries may lead an investor to overweight them in a portfolio to the exclusion of less familiar asset classes or sectors, and possibly to the detriment of overall investment performance or risk management. 4. Mental Accounting. When it comes to money, we tend to compartmentalize. We may try to save a couple of dollars on a weekday lunch but think nothing of spending twenty times that while on vacation. Through mental accounting, we tend to view the same dollar amount differently based on what we’ve mentally earmarked it for. Retirement savings, for example, may be a mental compartment in which a dollar is more sacrosanct than in a self-directed trading account. Understanding these compartments, and making sure each has an appropriate share of total worth, can help a client buy, spend, save and invest more wisely. 5. Gambler’s Fallacy. This behavior tends to view a coincidental series of events as predictive. If a coin toss comes up heads six times in a row, it doesn’t mean it’s less likely to be heads than tails on the seventh. But the fallacy discounts the logic because we humans tend to see patterns in random events. So, if a stock gets repeatedly hammered, the flawed thinking says it’s got nowhere to go but up. While coffee lovers around the world await the eagerly anticipated Starbucks holiday cups, the company has thrown a brand reinforcing tidbit our way in the form of its newest reusable cup. 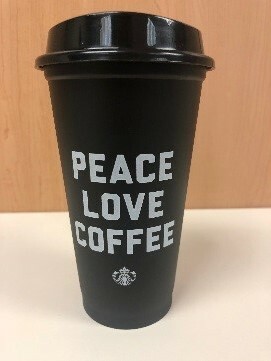 Sold at the register for $2.00, these cups are “grande” size and can be used when ordering drinks. Made of plastic, they are designed for multiple use and can be recycled. To date, they have all been primarily white, mimicking a regular Starbucks paper cup. From time to time, they have had a thematic or purely artistic design, but always retained the large central Starbucks logo as the visual focal point. The back of the cup does have the Starbucks name and the different boxes for your coffee drink order. The front of the new cup is different, however, in a few ways. Despite this relative lack of branding, most viewers instantly identified it as a Starbucks creation. Even when the logo itself was covered, a random, non-scientific sample universe still guessed that it was a Starbuck’s product. Why? Winning brands are recognizable with or without a name or logo through consistent and stringent application of brand essence throughout every product or service they offer. Optima Group helps wealth and asset management firms become brand leaders in the industry. Big news, Dunkin’ dropped the Donuts from its name. If you really like donuts, this is huge. If you are like us, and follow branding trends, this is really huge. Some of you are skeptical, we get it. What’s the big deal, let’s face it, the whole rebrand thing didn’t work out so well for GAP. This is different. 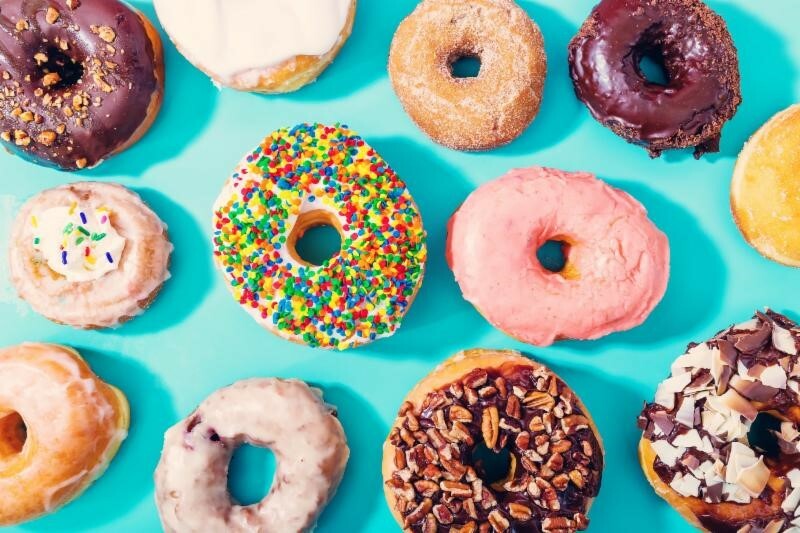 For one thing, in a health-conscious competitive marketplace, doughnuts are not up there on the list of things that are good for you. By eliminating the word donuts from its name consumers could grow to believe Dunkin’ is an option for healthier foods. Ditching the donuts might help Dunkin’ in its ongoing coffee war with Starbucks, which dare we say, also sells unhealthy food products, but doesn’t allude to this in its name. This may also be a case of a brand listening to its consumer base and adjusting accordingly. Think of it this way: you’re rushing out the door on a Saturday morning trying to get two kids onto two different fields for whatever sport they are playing this season and as everyone is buckling up you say, “We’re going to stop at Dunkin’ on the way.” Your teenager, your mom, your significant other…everyone knows them as “Dunkin’” (unless you’re an old-line New Englander) and now they have acknowledged it. Brands evolve and must align with what their audiences make them. The company made the decision to become a “beverage-led, on-the-go brand.” As we sit here and watch the stock go up (for this moment in time anyway) it may appear it was the right decision. Time will tell, but we think it’s refreshing when a brand refreshes. They can take the donuts out of the name as long as they don’t take them out of the store.